Ben Gardiner is an Australian barrister who specialises in intellectual property law. North Pole Bananas website by Ben Gardiner is licensed under a Creative Commons Attribution-NonCommercial 4.0 International License. 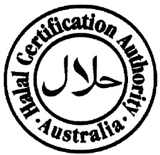 $91,000 in additional damages was awarded against Quality Kebabs, a wholesale manufacturer of kebabs, for the infringement of a trade mark (depicted below) owned by Halal Certification Authority Pty Ltd, a company which, as its name suggests, is in the business of certifying food as being compliant with the relevant Islamic rules relating to the preparation of food.